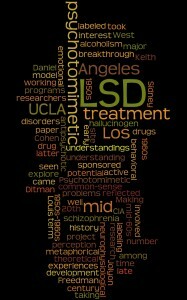 From the mid 1950s to the early 1960s, LSD was seen as a potential breakthrough in the treatment of alcoholism and other behavioral and emotional disorders; Sidney Cohen and Keith Ditman at UCLA were among the researchers working on these problems. The CIA took a very active interest in LSD at this time and sponsored a number of research programs. By the mid-60s, the hallucinogen had been labeled a “psychotomimetic,” a term which reflected common-sense understandings of experiences taking the drug, as well as the theoretical perception of LSD as a model for the understanding of schizophrenia and the development of antipsychotic drugs for its treatment. Again, UCLA was a major site for the latter project, with Louis Jolyon West and Daniel X. Freedman involved both before and after they came to Los Angeles. In this work-in-progress, Schraff will explore the history of LSD’s labeling as a psychotomimetic, from the metaphorical to the neurophysiological, in the mid to late 20th century. Box lunches (or buffet of various salads) are provided to attendees who reserve a seat by noon Monday, June 2nd. Coffee and water will be available; attendees should bring their own other beverages. Reservations received after that time will not have lunch orders (please be advised that we require reservations because we must submit a list of confirmed attendees when placing our food order). The UCLA History of Medicine and Medical Humanities Research Forum (this is the 20th meeting) is made possible by the Program in Social Studies in Medicine, David Geffen School of Medicine at UCLA, by the History of Science, Technology, and Medicine Program in the UCLA Department of History, and by History & Special Collections for the Sciences, UCLA Library Special Collections.